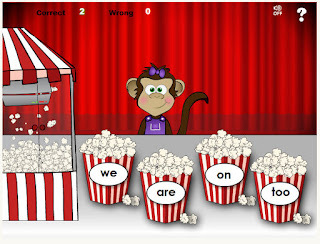 Your students will have fun learning dozens of common sight words with Popcorn Words from Fun 4 The Brain. Listen to the word and click on the correct popcorn container. If you get enough correct, you will promoted to manager of the movie theater. What a great game! It would be slightly easy for my grade two students however I will be passing this game onto teachers in the younger years and I also look forward to playing it with my five year old niece! Fun 4 the Brain has some great games. My students love the maths games! This is a terrific blog, keep up your great work! Thanks for another great resource. I had avoided Fun 4 The Brain because of the banner ads, but being able to have kids access some activities without ads is wonderful! Thanks! Fun for the Brain has so many truly cute activities. This is such a fun way for students to practice sight words. I am with Emily, for a while I had stayed away from fun for the Brain because of the ads, but @2sparkley started posting on them and now I am hooked. I like this site I have already shared it with several teacher friends. and put it on a site for my students.